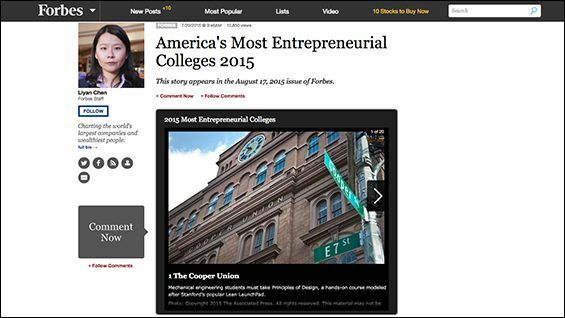 Forbes Names Cooper Union the "Most Entrepreneurial" College in U.S.
Forbes magazine has named The Cooper Union as the nation's Most Entrepreneurial college in its August 17th issue. "The Cooper Union, which tops our Most Entrepreneurial College List this year, boasts more founders and owners among alumni and students on LinkedIn than Stanford University and MIT (adjusted for student body size)," according to Forbes. The schools were ranked by, "the total number of alumni and students who have identified themselves as founders and business owners on LinkedIn, divided by the school’s student body (undergraduate and graduate combined)." Research universities were ranked on a separate list from smaller colleges. A related story headlined How Liberal Arts Colleges Reinvent Themselves As Startup Factories, quotes Eric Lima, associate professor of mechanical engineering and co-founder of the Invention Factory.